How Popular is Poker in the Cultural Zeitgeist of Japan? Japanese comic books and graphic novels, a.k.a. manga is geared towards an adult population of readers, as well as younger audiences. The Japanese are particularly partial to these artistic renderings, whether they be in comic book form or film adaptations. The name given to Japanese animation is anime, and its growing popularity is cutting a swath with fans all over the world. There are notable differences between Japanese animation and animation in the West – notably the style of animation used and the audience it caters to. The adult Japanese anime-watching population numbers in the millions. The comic book version of anime is known as manga. Ever since WWII, anime and manga gained considerable popularity throughout Japan. At the time the Western equivalent, Walt Disney animation was losing ground as the war effort dragged on. The integration of poker into Japanese culture took time. Various entertainment pastimes now characterise the poker scene in Japan. Many novices and expert poker players are eager to see poker brought into the mainstream. Poker has quickly taken the world by storm. This exciting card game blends skill and strategy in an entertaining ensemble. Today, poker aficionados eat, sleep and breathe poker. The game has a unique lexicon and it’s tearing it up on the circuit. Players from Toronto to Tokyo are competing in pulse-pounding games of Texas Hold’em and it’s now evident in Japanese manga and anime too. Poker features as the ranking game on the big money circuit. Major global tournaments like the WSOP, ANZPT, WPT and Aussie Millions reel in thousands of players per tournament. With prizes pools in the mega-millions, poker has fast become a staple of high rollers and greenhorns alike. Poker has successfully migrated across the Atlantic and Pacific and is now enjoyed across Asia. The game has garnered top billing in the populous island nation of Japan too. This is evident in the Akihabara district in Tokyo. A notable casino in the city – Akiba Guild – offers poker games to its patrons. What makes this poker zone particularly notable is its infusion of anime into the card game. The poker dealers are nattily clad in costumes, and they (female dealers between 16 – 20) interact with players in some or other fashion, like hand gestures or dancing. This particular destination in Japan’s capital city is home to high rollers too. Many of the world’s legendary poker players compete for entry to major tournaments such as the Asia Pacific Poker Tour, World Series of Poker, the All Japan Poker Championship and others. Anime characters are a dime a dozen. 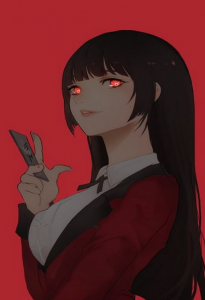 But one of the most recognizable gamblers is Kakegurui. This manga series (created by Homura Kawamoto), was originally launched in March 2014, and the Kakegurui Twin was launched in 2015. These high-rolling gamblers love to shuffle up and deal and now Westerners can also enjoy this dazzling animation in English on Netflix. 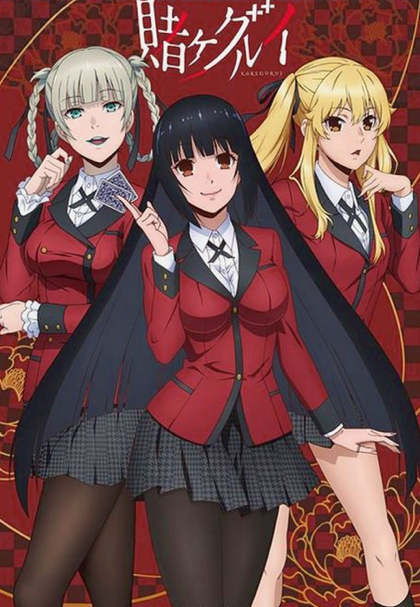 Kakegurui debuted as a TV-14 anime show with the High Roller Jabami planning to bring the house down with a monster score at the acclaimed Hyakkaou Private Academy. This Manga comic book turned anime series is wildly entertaining. The Private Academy is home to gambling games and students must graduate from there with distinction. 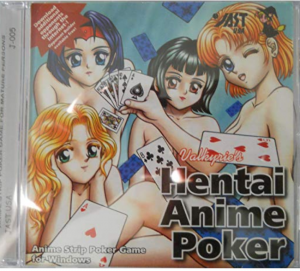 Given that it’s limited, poker fans with a penchant for anime are particularly partial to it. However, of all the characters that adorn the ranks of the anime world in Japan, it is clear that Kakegurui’s Momobami Kirari is a big hit. She is always seen with a swagger in her step and an air of confidence that fills the room whenever she enters. The Japanese anime scene is peppered with nuanced characters who enjoy playing cards. These include an interesting deck of anime characters known as One Piece Luffy. This particular deck of cards features 52 cards and 2 jokers. Each of the cards showcases a different image. As part of the popular ‘One Piece’ gaming phenomenon, the artwork is par excellence and the cards display well-printed images. When it comes to Japanese manga, and poker, there’s always room for Poker King. This 8-chapter book features Nikaido Hiroshi and his siblings. Once they’ve inherited 100 million yen, it’s a race to become the kingpin of the Nikaido corporation. 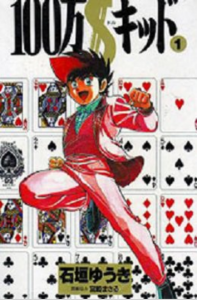 Published between 1986 and 1988, this manga series has gained critical acclaim from the poker-playing community. Otherwise known as Casino Kid, or Million Dollar Kid, this manga series is all the rage with fans.